HEP experiments have several workloads that are more I/O intensive then traditional HPC ones. The I/O patterns can vary considerably often involving small transactions and random patterns. A lot of existing work for experimental HEP applications on HPC has avoided this issue by only running simulation workloads. HEP-CCE is helping support the efficient running of I/O-heavy ‘analysis’ workloads on HPC facilities. 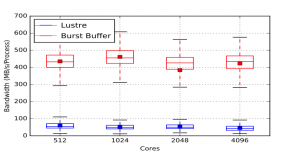 At the same time the HPC community has been exploring the ‘storage hierarchy’, and fast storage layers, close to the compute, termed Burst Buffers. Several HEP experiments have been used as early users for the NERSC Burst Buffer, as reported at CHEP 2016. This work has shown significant performance improvements over traditional file systems, as shown in the figure below for an analysis application for the ATLAS experiment. This has been applied to several HEP/NP/Cosmology workflows showing that I/O is no longer a barrier to these experiments on HPC.